Sikes and Francisco seek an elusive Newcomer woman - all of whose dates wind up dead. George worries about Susan's fidelity. As Halloween approaches, a series of Newcomer murders seems to follow the pattern of a Tenctonese myth. An Overseer named Ahpossno comes to Earth to take the slaves, and all humans, back to the mothership. Susan Francisco: Are you always this pissy when you're conducting an investigation? Detective George Francisco: Susan, I believe "pissy" is a vulgar word. Susan Francisco: Really? Gee, I hear it used all the time. A really wonder science fiction show. "Alien Nation"is a science fiction show that is well done,well acted and well created by Kenneth Johnson(The Incredible Hulk, and V). The series dealt with a lot of issues, especially racial issues,and cultural issues too. The Tenctonese are a race that were slaves who came to earth cause of their ship crashing in the Mohave Desert in 1991. The Tenctonese are from the planet Tencton, they have the ability to adapt in any environment, they learn fast and live a little longer than Humans,they are known to us Humans also as Newcomers.There are Humans who don't like the Newcomers, they are called Purists, the Newcomers are called Slags, the word "slag" is a racist term by the Purists.The Newcomers that don't like Humans much call us Humans, "Terts". Human cop Matthew Sikes, played superbly by Gary Graham(All The Right Moves, Robot Jox, and The Last Warrior), is a cop who lost his former partner to a Newcomer in a robbery. Sikes's new parter, a Newcomer cop, Det. George Francisco, played awesome by Eric Pierpoint(Invaders From Mars, Forever Young, and Liar Liar), work together to fight crime. The two Detectives have their disagreements on certain issues,but work great together. Cathy Frankel, played awesome by Terri Treas(Seven Brides For Seven Brothere, The Nest, and House IV)is Matthew Sikes's Newcomer neighbor who he develops a relationship with her later on, Capt Bryan Grazer, played by Ron Fassler(Camp Nowhere, Child's Play 3 and Gremlins 2), Det. Dobbs, played by Lawrence Hilton-Jacobs(Welcome Back Kotter), Albert Einstein, a Newcomer janitor, played by Jeff Marcus, are some of the members of the precinct. George Francisco's family consists of Susan Francisco, played by Michele Scarabelli(Air Wolf),Buck Francisco, played by Sean Six, is a teenage Newcomer who has got into some trouble, but has got better, though he has resentment towards Humans. Emily Francisco, played by Lauren Woodland(The Young And The Restless), is a young Newcomer girl who is a nice girl who is smart. 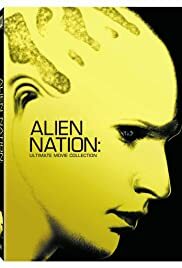 I was very upset that Fox canceled "Alien Nation"in 1990, but they did redeemed themselves by making 5 "Alien Nation" TV movies, "Alien Nation:Dark Horizon", "Alien Nation:Body And Soul", "Alien Nation:Millinium", "Alien Nation:The Enemy Within", "Alien Nation:The Udara Legacy". I give this show 10/10 stars and 2 thumbs up. The "Alien Nation" TV series was based on the "Alien Nation" movie that came out in 1988.